This legal ruling would seem to suggest that discriminating, mass stop and searches of all non-whites unfortunate enough to passes a checkpoint is not sufficient information to cause an inquiry to occur. 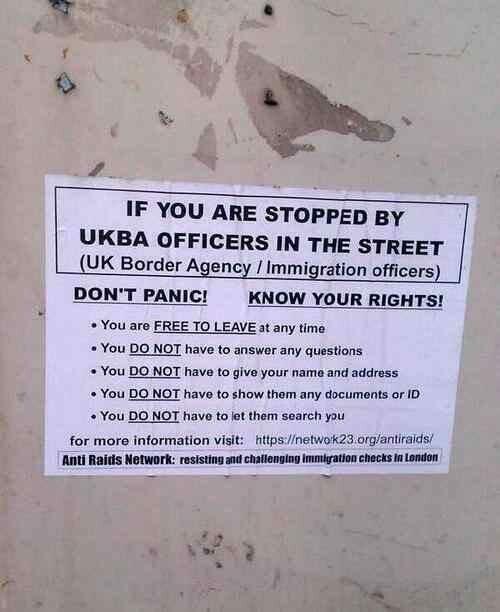 In other words the oppressive tactic demonstrated by the Home Office and/or UK Border Agency and/or police is, according to the law which these organisations profess to be upholding, illegal. More illegal at least than most of the victims harassed and rounded-up. An immigration officer is entitled under para 2 of Sch 2 to the Immigration Act 1971 to conduct an examination of a person who has arrived in the United Kingdom away from the place of entry and on a date after the person has already entered if he has information in his possession which causes him to inquire whether the person being examined is a British citizen, and if not whether he may enter the United Kingdom without leave, and if not whether he should be given leave and on what conditions. First they came for the Jews, Disabled, Poor, Trade Unionists, Dissidents, Communists, Muslims immigrants….